Keith, Phil, Dave, Dean and I were in attendance for our 46th meeting. We started the meeting with a quick review of a couple of Internet astronomy resources. One resource is from an astronomer, Chris Impey, of the University of Arizona. His site TeachAstronomy has a good mix of short text and video clips. Chris also teaches an 11 week MOOC on the Coursera platform titled “Astronomy: Exploring Space & Time” which I took in the Fall of 2015 and thoroughly enjoyed. The class was self paced and dealt with both technical and philosophical aspects of astronomy. The other resource is the four classes on the EDX platform from two astronomers from the Australian National University, Paul Francis and Nobel laureate Brian Schmidt. The classes slightly build on each other and are titled: 1) Greatest Unsolved Mysteries of the Universe; 2) Exploring Exoplanets; 3) Violent Universe and 4) Cosmology. I’ve also taken these classes and found them very entertaining but they get much more into that mathematical calculation of various astronomical situations. If can be quite empowering to calculate the balance of centripetal force and gravity to calculate how fast a white dwarf star can spin before it begins to tear itself apart. I also gave everyone a “heads up” that the first two installments of the new Science Channel series “Space’s Deepest Secrets” have been very good. The first episode on April 26 was a 2 hour collage of 6 very recent topics and the second episode on May 3 dealt with dark energy and matter. We lead off the meeting with the recent accomplishments of SpaceX. 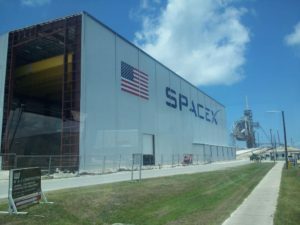 As recently as the morning of the meeting, the company successfully landed its Falcon 9 first stage on a barge in the Atlantic for the second time. They also successfully resumed sending supplies to the ISS with their Dragon capsule on April 8. This was their 7th paying mission and its brought up the BEAM (Bigelow Expandable Activity Module) as well as 20 mice to study muscle atrophy and cabbage to grow and eat in space. SpaceX has an agressive schedule of 18 launches planned for 2016. The launch the morning of the meeting was already their 4th one for the year. Bringing the first stage of the Falcon 9 back is an amazing accomplishment when you look at the size of it. SpaceX estimates that they will shave 30% off the $60 million dollar cost of the rocket by reusing the first stage. Elon Musk said the rocket would be reusable for 10-20 missions and with some minor refurbishments maybe 100 missions. Its quite an emotional moment for me to listen to the cheers of the SpaceX employees as the rocket lands on the barge called “Of Course I Still Love You”. This occurs at about 26:00 (min:sec) in the video and they begin to chant, “USA, USA, USA, … at 28:30. There also is a phenomenal 4K quality video of the landing that shows how rough the seas were. I’ve heard there were 50 mph winds at the time which makes the landing all the more amazing. The first stage uses 3 of its 9 engines to counteract its easterly launch motion and then begins the return to Earth. The actual landing on the barge occurs with only 1 engine firing. It is also interesting how the stage uses paddles (2nd video on page) to keep itself properly orientated for landing. It looks like this rocket landed a little at an angle and might have damaged one of its landing legs. Here is a video shot from the barge. The plan with the the first sea recovered stage is to test fire it 10 times and if successful use it for a new satellite launch sometime in the Fall. When the stage was being returned to its storage hanger at the Kennedy Space Center there were a couple of humorous videos (the first & third videos) showing the amazment of people as to its size of the stage. The BEAM that was tranported to the ISS had been attached to one of the ports of the station. It will be expanded to its full volume 4 times its transport size sometime latter in May. It will stay on the ISS for 2 years of testing. Its Kevlar exterior is anticipated to be better protection to micrometeoroids than the metallic walls of the typical ISS modules. BEAM is 565 cubic feet and 3100 lbs, but Bigelow has plans for a much bigger cousin which weighs 43,000 lbs and is 20x bigger at 330 cubic meters. They hope to launch 2 B330’s on Atlas 5 rockets, dock them together and then use Dragon and Starliner capsules to form a new space station by 2020. Inflatables look like the future for deep-space habitats and moon and Mars living quarters. Our main topic for the night was Keith helping us discuss his article published in the Spring 2016 Ad Astra magazine (you need to be an NSS member to read the article) titled “Space Colonization: What are we waiting for?”. His point is that the long duration of the project will require new type of support, much longer and more stable than has been available to past space projects. It will need to be International and probably will require a new form of government organization. He also notes that space projects have many tangible benefits for the people of Earth. Jobs and the accumulation of new technologies will make life better for those that remain behind and build and support the effort. Perhaps the greatest benefit will be the sense of accomplishing something that improves the state of all humanity. We discussed the topic for 45 minutes and followed up with Neil DeGrasse Tyson interviewing Bas Lansdorp the CEO of the Mars1 one-way trip project. We all agreed that Mars1 might be a little naive about the efforts required to put people on Mars and that Buzz Aldrin’s plan detailed in his book “Mission to Mars: My Vision for Space Exploration” has more engineering rational behind it. CRS2 contracts for cargo to the ISS – NASA recently selected a cargo version of Sierra Nevada’s Dreamchaser as its 3rd partner along with Dragon from SpaceX and Cygnus from Orbital-ATK for the timeframe of 2019-2024. Each company is assured at least 6 flights. Dreamchaser looks quite cool with its wings folded in for launch. It is extremely flexible vehicle because it can either dock or berth to the ISS (Berthing involves using the robotic arm of the space station to perform the attachment. The advantage of the berthing ports is a larger diameter opening so that bigger equipment can be passed through.) Other advantages include being able to be launched on either the US’s Atlas 5 or the European Ariane 5 rocket, the ability to provide re-boost of the ISS and the ability to return cargo to the ground in just 3 hours by landing on a airport runway. The water landings of Dragon take a minimum of 6 hours to be retrieved. During the CRS2 competition SpaceX scored 922 points, Orbital 880 and Sierra Nevada 879 out of 1000 possible points. Orbital was the cheapest and SpaceX the most expensive. But you have to factor in that Orbital’s Cygnus capsule burns up in the atmosphere and does not return any cargo back to Earth. The Russian Progress capsule carries about 5500 lbs, Cygnus can carry 7100 lbs with the new Antares rocket, Dragon is rated for up to 13,228 lbs with it split 44/56 between pressurized and unpressurized cargo and can return 6614 lbs to Earth, Dreamchaser can carry 12,125 lbs and return 3858 lbs. Talk of a CIS-Lunar Human Outpost – The Europeans really would like to go to the moon before heading for Mars. I think that makes a lot of sense to practice our long duration stays at a place we can get back to Earth in only a few days. Building the infrastructure around the moon for extended time and distance travel in space seems more logical than trying “hail Mary” trips to Mars before your equipment has most of the bugs worked out of it. I totally don’t agree with President Obama when he said about the moon that “we’ve done that”. Our short Apollo stays are nothing compared to a long stay and infrastucture development in the CIS-Lunar environment. The head of ESA describes their vision under the “moon village” video. Pentagon spends more than NASA on space – DoD budget for 2017 is $22 billion. NASA’s budget is typically about $19 billion. Commercial Crew Risks – I was surprised that both Boeing on Starliner and SpaceX on their man-rated Dragon capsule are working to a metric of 1/270 loss of crew risk. That seems a little high but the risk on the Shuttle was listed as 1/90 and I think the Shuttle risk was much higher after they concluded that they couldn’t stop the shedding of foam off the external tank. Two of the top concerns about the new capsules are the adding of a second Centaur engine to the second stage of the Atlas 5 and the use of densified fuel by SpaceX in their Falcon 9 rocket. The Dragon crew will have to board before the Falcon 9 is loaded with its fuel because it warms so quickly once loaded in the rocket. Boeing is being paid $4.2 billion ($959.3 million already paid) to bring Starliner to operational status and SpaceX is getting $2.6 billion ($498.7 already paid). Details of both capsules and size comparisons can be seen here. NASA will continue to buy seats from the Russians through 2018 for trips to the ISS. NASA plans on both capsules to be available in 2018 and will contract for at least 2 but as many as 6 crewed missions to the ISS until the ISS is retired in 2024. Scott Kelly has retired April 1, 2016 at age 52 from NASA – He is writing a book entitled “Endurance: My Year in Space and Our Journey to Mars” which is due out in late 2017. He is quoted as saying the hardest part of being in space so long is being isolated from people important to you. “During my time in orbit, I lost bone mass, my muscles atrophied, and my blood redistributed itself in my body, which strained my heart. Every day, I was exposed to 10 times the radiation of a person on Earth, which will increase my risk of a fatal cancer for the rest of my life. Not to mention the psychological stress, which is harder to quantify and perhaps as damaging.” He put in an appearance at a Microsoft conference and is an ambassador for Breitling, a Swiss watch manufacturer. John Grunsfeld Retiring – He headed NASA’s Science Directorate and fixed the Hubble Telescope a few times. Anomally Grounds the Atlas 5 – Orbital-ATK was fortunate that their Cygnus supply craft made it to the ISS on the Mar 22, 2016 launch. The Atlas 5 first stage engines shut down 6 seconds early due to a fuel mixture valve and the second stage Centaur engine had to fire for an extra minute beyond its nominal 14 minutes to get Cygnus into an acceptable orbit. It was the second time that Orbital has used the Atlas 5 after its Antares rocket exploded just after liftoff at their Virginia launch site in October 2014. Orbital is scheduled to begin using their new Antares rocket in July of this year. Atlas 5 launches should resume toward the end of June if they are confident that the fuel mixture valve was the problem. Steven Hawking and Russian billionaire join forces to launch nanoprobe to the nearest star – Yuri Milner pledging $100 million to the effort to launch butterfly sized probes power by a sail pushed by lasers from Earth. Milner has also given money to buy time on large radio telescopes so researchers can listen for signals from extraterrestials. Great New Detailed views from Dawn of the asteroid Ceres – 2.5 minutes video with a good description of the features. First Launch from new Vostochny Cosmodrome – Putin was there to watch, the launch was delayed a few days but eventually made it to space. The spaceport has cost a least $6 billion and had widespread corruption issues. Baikonur costs the Russians $115 million per year in rent to Kazakhstan. It will still be used until 2023 for manned launches. Vostochny is in the far east section of Russia near Japan at 52 degrees north latitude. Baikonur is at 46 degrees. Being nearer the equator, Baikonur launched rockets will get more of a boost from rotation of the Earth and be able to lift more payload into orbit. Unfunded agreement between NASA & SpaceX – Musk wants to land a Dragon capsule on Mars by 2018. SpaceX says Falcon Heavy can get 29,000# of payload to Mars. MSL which brought Curiosity to Mars weighs 8500#. Nice video with dragon engines, 1st stage landing & falcon heavy launch. Bobby Braun says the agreement saves NASA from having to do a $3B test and helps SpaceX accomplish its feat by understanding the characteristics of the Mars atmosphere. Dragon would weigh about 8 tons on entering the Mars atmosphere and use 2 tons of propellant to land its remaining 12000#. The Curiosity rover vehicle weighed 3.6 tons before hitting the atmosphere and weighed 900 kg (1980#) on surface. Makemake has a moon – Analysis of the orbits will enable an accurate mass calculation for the pair. Makemake is 1400 km in diameter and is one of the 5 dwarf planets. It is 46 AU distant with a 310 year orbit. It is the 2nd farthest & 3rd largest dwarf planet. The moon is 160 km in diameter with 12 day orbit. 3 Exoplanets the Size of Earth Found Around a Star only 40 Lightyears Away – Ultracool star TRAPPIST-1 (TRAnsiting Planets and PlanetesImals Small Telescope) is only 1/2000 as bright as the Sun. The exoplanet even at there closeness to the star could still be in habitable zone. The first exoplanet is in a 1.5 day orbit, the second orbits in 2.4 days, and the third has not yet been defined. The Hubble Telescope will make follow up observations and eventually the JWST will be ideal to do studies to characterize the exoplanet atmospheres. The exoplanets were found with a robotic telescope only 60 cm (24 in) in size at La Silla Observatory in Chile operated from Liege Belgium. The group is only studying 60 ultracool stars through transit light dips. For comparison the Kepler satellite has led to the discovery of 1041 confirmed exoplanets by searching more than 150,000 stars.